Space enthusiasts are invited to become scientists to help identify massive solar eruptions by watching video clips recorded in space. Footage of hundreds of coronal mass ejections (CMEs) erupting from the sun's surface were captured by the two NASA STEREO Spacecraft, now on the other side of the sun. Each made up of a billion tonnes of matter travelling at a million miles per hour, these solar storms are capable of damaging satellites, overloading power grids and exposing astronauts to cancer-causing radiation. Scientists from the University of Reading are now asking members of the public to help review the images in the latest release of the Solar Stormwatch project, hosted by Zooniverse, to determine how these vast eruptions from the solar atmosphere are distorted by solar wind. Understanding this process is vital to improving forecasts of such storms arriving at Earth. Professor Christopher Scott is Professor of Space and Atmospheric Physics at the University of Reading and is leading the Solar Stormwatch project. He said: "This is another chance for space fans everywhere to take part in some serious science that will ultimately help protect astronauts on space missions, as well as spacecraft and power-grids that people around the world rely on. "We need you to help us build a picture of how these huge solar storms evolve on their way to Earth, in order that we can predict their impact on our modern technological infrastructure." The first task for Stormwatchers who register for the project, which launches on Wednesday 20 September, is to plot the outline of CMEs recorded by the spacecraft. This 'Storm Front' task will allow scientists to collect data on how much these storms change as they travel through space. The tasks can be done on a home computer, and no scientific experience is needed. The sun is an active star, continually ejecting material into space and while it is not uncommon for smaller storms to reach our planet, if an extremely fast eruption were to hit Earth, it could have significant and long-lasting harmful consequences to the technologies we rely on. Two STEREO spacecraft were launched in 2006 to study space weather. Launched into Earth-like orbits ahead and behind the Earth, the two spacecraft were the first to have a side-on view of storms travelling from the Sun to the Earth. Storm images from 2007-10 were mapped by hundreds of volunteers in the first Solar Stormwatch project, leading to seven scientific publications. There are now many new images from 2010-16 – a period of much higher solar activity – making this a crucial period for study. 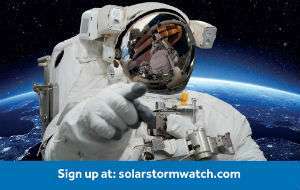 Register to become a Stormwatcher, and watch training videos, on the Solar Stormwatch website.